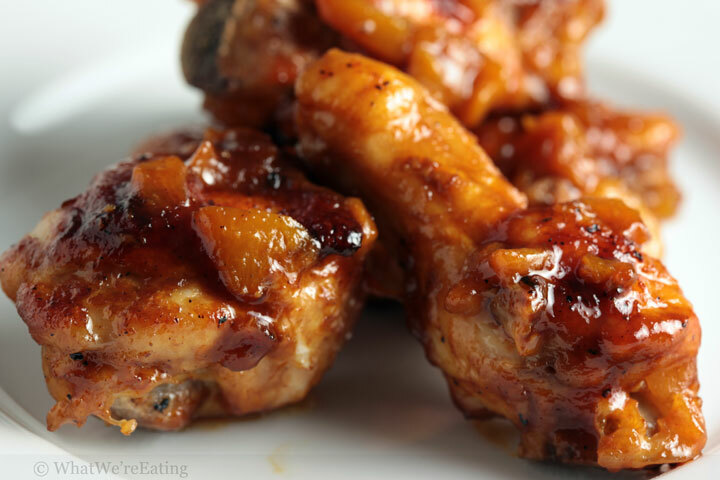 We’re eating sweet and spicy chicken wings baked in a sriracha, peach and soy glaze. I freaking love football… and not just because it makes cracking a beer at 10am completely acceptable. I love it for the intensity of the game, the astounding athleticism of the players, the fanatical crazy fans and yes… the tailgating food. Tailgating food changes from region to region, and while in Baton Rouge you’ll see tons of people eating gumbo or jambalaya in San Diego it’ll be tangy ceviche and carne asada tacos. One of the tailgating foods that seems to be in every region of the country is the almighty buffalo wing… and I must say, thanks, Buffalo, for such an awesome creation! If there’s a heaven, I hope it’s filled with calorieless buffalo wings, blue cheese dressing, bacon and good beer. Open the can of peaches. Strain the heavy syrup from the peaches into a small sauce pan. Place the syrup over medium to medium-high heat and reduce in half. Place three peach halves into a blender or food processor with the reduced syrup, sriracha, vinegar and dark soy sauce. Puree until smooth and transfer to a bowl. Line a baking sheet with aluminum foil. Season the chicken wings lighly with kosher salt, toss to coat. Place the wings into the lined sheet pan. Evenly pour the sauce over the wings, toss to coat with sauce, and place into the preheated 400 degree oven. Bake at 400 for 50 minutes, flipping the wings and basting with sauce in the pan after 25 minutes. Remove from oven. Using tongs, carefully transfer wings to a serving dish then spoon remaining sauce from the pan over the wings. Enjoy! I LOVE “super easy.” YOU should call these Georgia Wings. Holy balls these look delicious. Superbowl Sunday is one of my favorite food holidays, and these wings will definitely be on the menu. Thanks for sharing! The wings sound delicious but what’s the problem with Penn State beating LSU ;>). Hope you and Tyler are doing good and your cookbook is coming along. Then you should hold of making these wings on Feb. 7. 😉 If not for the jinx, I’d say they’d make a perfect Super Bowl party dish. Go Saints! I made these the other day. I made a couple changes – I could not find peaches in heavy syrup anywhere, so had to use light syrup. I also pureed all the peaches as I couldn’t see the point of finely dicing them. I think that may have been a mistake as the sauce did not reduce and this left me with “flabby” wings. If I had not done this would they have been crispy or at least less flabby? I increased the sriracha sauce to 2 tablespoons and added a bit of maple syrup fpr sweetness to make up for the fact that my peaches came in light syrup, not heavy. I really, really enjoyed the flavor of these and will be making them again. Thanks for posting! Hi there! Great website – I LOVE your faces on the food in the header. Very creative. This recipe looks like one I’ll definitely have to try. Thanks for posting! Wonder how these would go over grilled?? I am making these for dinner tonight and while they are not finished yet, the sauce is AMAZING! I couldn’t find peaches in heavy syrup…okay, I actually didn’t realize I needed heavy syrup until I had bought the peaches and was at home…but I still think it’s tasty anyway! 40 more minutes to go and I can’t wait! Next I plan to try your bourbon chicken because I love that stuff and now I’ve got this big bottle of sriracha sauce and don’t know what to do with it! SO happy I found your site. LOTS of good looking recipes I plan to try out! That picture is indescribably fantastic. I could literally feel the crunch they are (inevitably when I make them) going to make. It’s like glamour shots for chickens. Found your wings on photograzing and made them last night! They were fantastic! We loved them! I baked them in the oven and finished on the grill. Amazing wings! Thanks for a great recipe! There aren’t enough “o”s for the Oooooooooooooooohhhhhhhhhhhhh I let out when i saw these. I was going to ‘Buffalo’ some chicken later in the week but you’ve changed my mind. I made this for my dad last night. So good! Super easy is right.